Dark Shadows News Page: Give Blood For Barnabas! 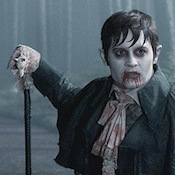 The American Red Cross has recruited Johnny Depp's Barnabas Collins to help their blood donation drive as part of a special promotion for the new Dark Shadows movie, beginning next week. Blood donors at participating Red Cross drives from April 16th until May 8th will have the opportunity to win a private screening of Dark Shadows in their hometown for up to 50 friends, along with merchandise from the film. For more information and to register online to give blood, click here. Is it weird to say this is cute?